Lights, Camera, Music! Introducing this years best value for the coming wedding season. A Party Trifecta of fun FOR UNDER $1000! 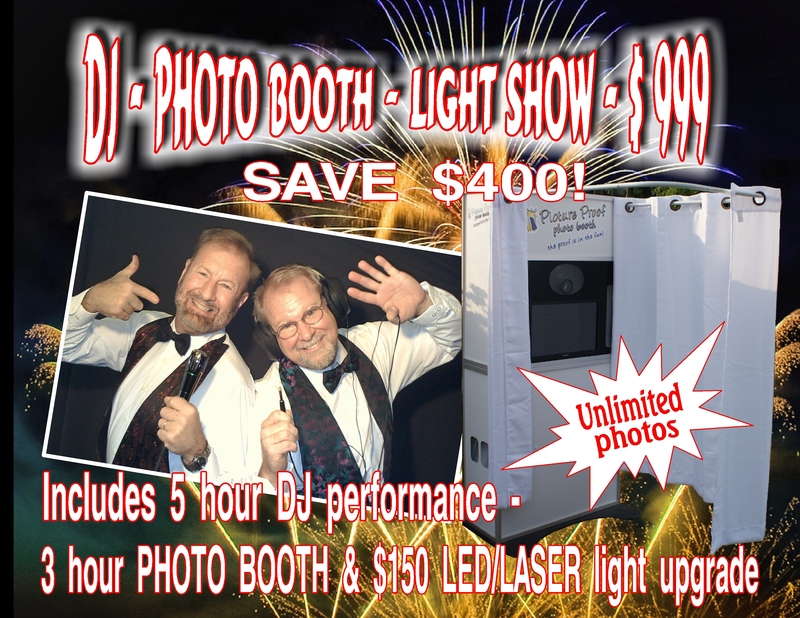 This offer combines 5 hours of Professional DJ/MC Service with 3 hours of Photo Booth and colorfully topped off with our $150 LED – Laser upgrade Lighting Package! This bundling super pack saves you hundreds off our regular Saturday prime time rates. We encourage couples to add special surprises for your big day. With that in mind, the newest trend in reception fun is the PHOTO BOOTH! The appeal & allure of the booth is undeniable! There’s something magical about it’s ability to entice party-goers to make a photo statement with wacky props & personalized message boards! NOT ALL PHOTO BOOTHS ARE CREATED EQUALLY! At Evansville Party Master, our Photo Booth uses the latest technology including easy to use, touch screen command & Cannon photo quality optics suitable for enlargement should you choose to do so. Our printer is super fast with state of the art double strip processing. 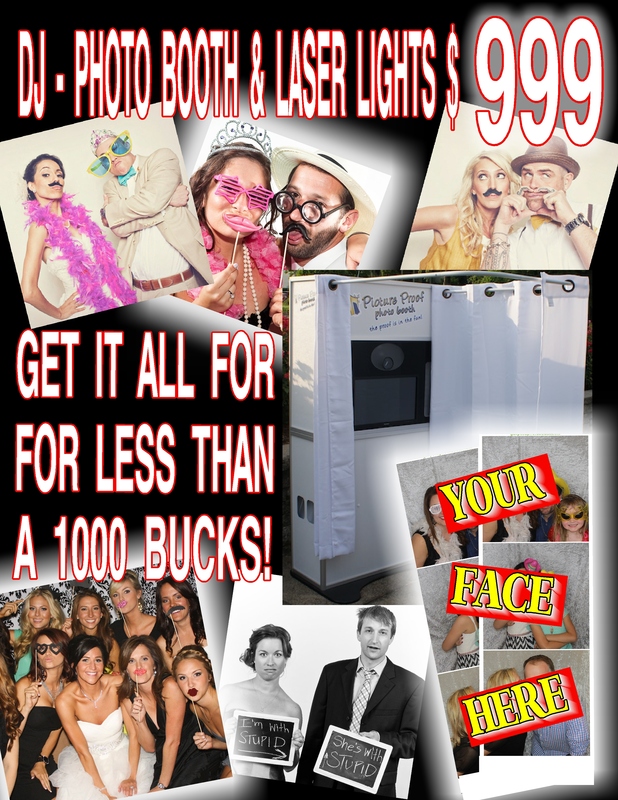 Beware of photo booths with poor quality web cam optics & low quality consumer printers that keep your guests waiting in line & slow down all the fun. 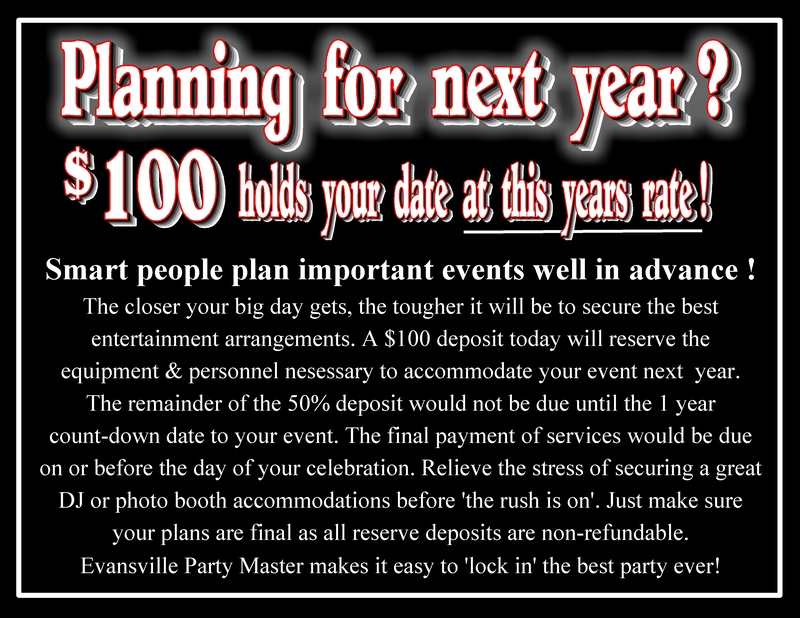 While Evansville Party Master can perform up to 4 DJ events on any evening, unfortunately, we only have one photo booth. And that means for each Saturday that someone books this exceptional offer, that date is no longer available for photo booth placement. So make your arrangements today because this is a limited time offer!